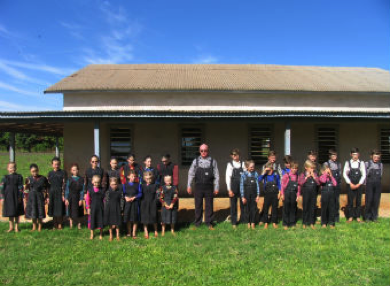 In the Latin American Mennonite colony, the village school is an important institution in the perpetuation of colony life. Each colony village typically brings all the students together in one-room classrooms with one male teacher where they learn to read, write and do basic arithmetic. Learning is largely done by rote. Children will generally start school at age 6-7. Girls finish school at age 11-12 while boys complete school at 12-13 years. The school year is based around seasonal farm work and is approximately 7 months long. School is understood as preparation for the church life that students will participate in as adults. School is understood as preparation for the church life the students will participate in as adults. It is here that they are familiarized with the three most important religious texts used by colony Mennonites: the High German Bible (Old and New Testaments are studied), the Catechism (statement of beliefs) and the hymnbook. In many cases, these books are the primary texts used for learning to read. Additionally, the Fibler (a primary reader) is used in traditional, Old Colony schools. As these are all printed in blackletter or gothic script, children also learn to read and write this script. Good penmanship is valued and therefore practised regularly. As in Canada, resources available in schools differ from region to region throughout Latin America. 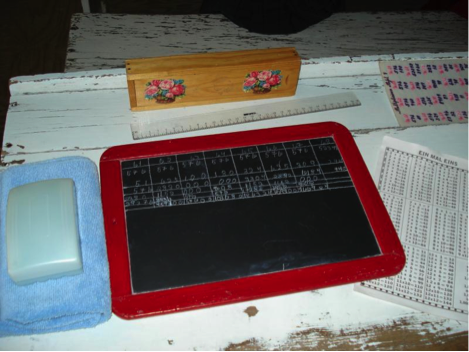 Some schools continue to use chalk and personal slates, while in other schools parents provide notebooks, pens and pencils. Typically, boys sit on the right and girls sit on the left (just as in church) with older students at the front of the class and younger students at the back. Children who excel sit in aisle seats while seats closest to the walls are for those who have more challenges. In regions where a variety of Mennonite denominations are present, the parochial schools operated by these churches provide a broader range of curriculum in addition to religious instruction and arithmetic. There are areas in Latin America where the Old Colony church is providing more ongoing teacher training, which allows the teachers to more effectively teach basic reading and math skills. In these areas, some new multi-room schools are also being built where children are placed in classrooms according to age and ability.